An off licence owner has been sent to prison for 16 weeks after being convicted of a number of offences relating to the possession and supply of illegal tobacco. Mohammed Ayoob, Director and Premises Licence Holder of UFC Off Licence Ltd in Shrewsbury Street, Old Trafford, and Withington Road, Whalley Range, was sentenced at Trafford Magistrates’ Court on Friday 10 August after previously being found guilty of offences under the Consumer Protection from Unfair Trading Regulations 2008, Trade Marks Act 1994 and Consumer Protection Act 1987. Following an inspection of the premises’ by Trading Standards, Police and the UK Border Agency in November 2011, over 5,000 illegal cigarettes and 250g of hand rolling tobacco were seized. A further visit to the Shrewsbury Street store in March 2012 resulted in the seizure of more illicit cigarettes and empty packaging. Not only was the illegal tobacco non duty paid and not legally allowed to be sold in the UK but also the hand rolling tobacco was found to be counterfeit. 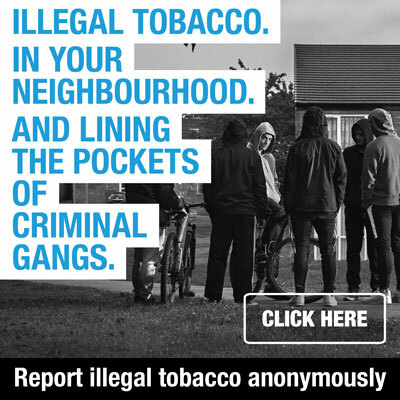 The ‘Keep it out’ campaign is a joint initiative backed by Tobacco Free Futures along with Trading Standards, HM Revenue and Customs and other partner agencies such as UK Border Agency and Police. 2 x Sold/Offered to supply/possession to supply tobacco which infringed registered trade marks contrary to the provisions of the Trade Marks Act 1994 receiving 8 weeks in prison for each offence to run concurrent. 7 x Possession for supply, tobacco products, in respect of which the producer had not complied with a requirement of regulation 14 of the Tobacco Products (Manufacture, Presentation and Sale) (Safety) Regulations 20022. Tobacco Free Futures is a collaborative programme funded by North West Directors of Public Health, and works in diverse and innovate ways to make smoking history for children. Tobacco Free Futures has achieved a great deal locally, regionally and nationally, in reducing smoking prevalence rates and protecting children and adults from tobacco harm. 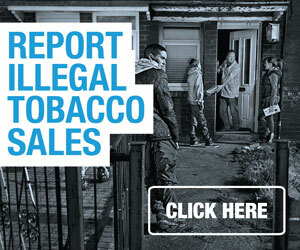 www.tobaccofreefutures.co.uk3. Smuggled – Foreign brands illegally brought into the UK. These often include ‘cheap whites’ which are cigarettes manufactured outside the EU especially for our illegal tobacco market. Bootlegged (Duty Free) – Foreign products brought into the UK (often in illegal quantities) and resold without duty being paid on them. Cigarettes brought in as duty free should be for personal use only and selling them on, even at cost price, is illegal. Counterfeit (Fake) – Cigarettes or hand rolling tobacco sold in fake packaging so they look like UK brands. These are often low quality and may contain things like rat droppings, sawdust and plastic. – 3 -Alison Klabacher, Trafford Council, Communications Unit, 0161 912 4080.